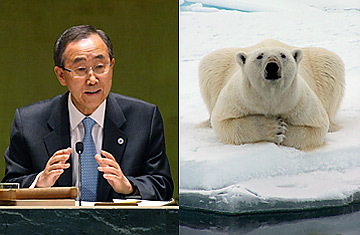 United Nations Secretary General Ban Ki-moon (left) speaks at the United Nations during a High Level event on Climate Change. Is Global Warming Drowning Africa? Early in Monday's high-level United Nations meeting on climate change, officials proudly told reporters that the summit, which brought together leaders and ministers from over 150 nations to discuss global warming, would be carbon neutral. The greenhouse-gas effect of the 5,000 tons of carbon dioxide produced to hold the meeting and to fly U.N. staff and participants to New York would be offset by a $15,800 investment in a small-scale hydroelectric project in Honduras. Thus, in terms of its ecological impact on the world's climate, it would be as if the summit had never happened at all. It's hard not to conclude that the summit's political effect may be just as nonexistent. U.N. Secretary General Ban Ki Moon gave what was by his mild-mannered standards an impassioned speech calling for rapid action on climate change, and world leader after world leader rose to the lectern to emphasize the danger of global warming. "Today, the time for doubt has passed," Ban said in his opening address. "The time for action is now." But at the end of the one-day session, the delegates hadn't come much closer to achieving the next meaningful step in the battle against climate change: negotiating a more complete successor to the Kyoto Protocol, which expires at the end of 2012. Though political awareness of the need to grapple with climate change was clearly at an all-time high  scores of national leaders don't suddenly convene at the U.N. without a decent reason  the global political will to actually do something still seems lacking. It's now 20 years since the issue of climate change was first raised in the U.N.'s General Assembly chamber by the island nation of Malta, 15 years since the Earth Summit in Rio de Janeiro and 10 since after the Kyoto Protocol was drafted  and many governments speak as if they'd just discovered global warming. Other concerns remain more pressing, including the war in Iraq  a fact that was made apparent when Iranian President Mahmoud Ahadinejad (who skipped the climate meeting) gave his speech at Columbia University in the afternoon, drawing crowds of delegates around nearby televisions. The essential deadlock that has held up stronger international action on climate change  striking an acceptable balance of responsibilities between developed and developing countries  remains unbroken, and there was little evidence that would change before the next major U.N. climate conference in Bali, Indonesia, at the end of the year. That was in no small part due to the absence of one national leader in particular: U.S. President George W. Bush, who chose not to address the U.N. meeting, though he did attend a dinner for leaders at Ban's request. (Secretary of State Condoleezza Rice spoke instead, emphasizing the importance of investment in clean energy technologies, over specific limits for greenhouse gases.) But Bush will be at a climate change summit of his own at the end of the week. The White House invited major carbon emitters  including developing giants China and India  to Washington to discuss long-term goals on climate action. Both U.N. and Administration officials insist the two summits would be complementary, not competitive, but since the White House continues to insist on mostly voluntary action to cut carbon emissions, and the U.N. process is based on Kyoto-style mandatory cuts, contradiction seems inevitable. "People are concerned because [the White House] does have a history of going its own way," Gro Harlem Brundtland, a U.N. special envoy on climate change, told TIME. "But the U.N. process is absolutely the way we have to go. Climate change affects every nation." But even if President Bush's meeting is meant to derail the U.N. conference  and the very fact of the summit raises hopes that the long-time climate skeptic may be thawing  the U.N. process could easily stall on its own. The Kyoto Protocol required emission cuts from developed countries that ratified the treaty, but not from developing countries, including fast-growing emitters like India and China. That double standard was the stated reason the U.S. refused to ratify Kyoto, and it needs to be fixed in the next round of climate negotiations. But there was little said in New York Monday to indicate that a solution would be found soon. Developing countries insist with much justification that they can't be expected to constrain their growing economies to slow carbon emissions, but it's difficult to see how citizens in developed countries  and not just in the SUV-loving United States  will accept strict limits while their economic competitors in India and China are allowed free rein. Nor is there much time to figure it out. "We only have two years to reach an agreement on post-Kyoto, and only three years to prepare the ground," says Achim Steiner, the executive director of the United Nations Environment Programme. "It's down to the wire." Beating the diplomatic buzzer will require innovation, and there were glimpses of the necessary creativity on Monday. Representatives from the Carbon Disclosure Project, a non-profit connected to hundreds of institutional investors controlling $41 trillion in assets, reported that major corporations have begun to increasingly act on climate change  outpacing many governments. Indonesia, the third-biggest carbon emitter after the U.S. and China, hosted a side meeting of rainforest nations, where they called for forest protections to be a larger part of Kyoto's successor agreement when negotiations start in Bali. (Deforestation is responsible roughly 20% of global carbon emissions.) "There is no better chance than in Bali to act decisively," Indonesian President Susilo Bambang Yudhoyono told delegates at the close of the summit. But the most inspiring words came from a prominent American politician who did show up at the U.N.: California Governor Arnold Schwarzenegger. The green-hued Republican, who backed a 2006 California law to reduce state greenhouse gas emissions 25% by 2020  exactly the sort of mandatory cut President Bush refuses to consider  told delegates that the time for debate was finished. "The consequences of global climate change are so pressing, it doesn't matter who was responsible for the past," he said. "What matters is who is answerable for the future. And that is all of us." Pointing to California's success in creating two vital new industries  computers and biotech  and the entrepreneurial energy unleashed in the rapidly growing developing world, Schwarzenegger contended that humanity could innovate its way out of the climate change deadlock. That might be a bit simplistic, but when Schwarzenegger called for "action, action, action, action" it was hard to argue with him.